A new campaign in NYC is rating restaurants according to how hospitable they are to breastfeeding mothers. This effort, called “Latch,” also offers decals to restaurants to show they support nursing mothers. It was the brainchild of four NYU graduate students and recently won first place (and $10,000) in the National Invitational Public Policy Challenge. Like Florida, New York law upholds a child’s right to nurse anywhere they are allowed to be, but some mothers still encounter opposition and ignorance when they are feeding their child. “Latch” is an effort to help create a cultural change, one restaurant at a time, by raising awareness, rewarding businesses who are friendly to nursing mothers, and empowering the hesitant public breastfeeding mom by giving her a place to go where she knows she will be supported by the establishment. I was in a restaurant in the Orlando area when I took the photo above of a flyer promoting a 2013 exhibit, “Nursing is Natural…Naturally Beautiful,” by Christine Santos, who hoped to use her photography to destigmatize breastfeeding. 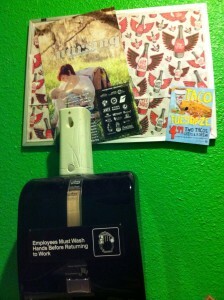 The flyer’s location struck me as a bit ironic due to its placement in the woman’s restroom. 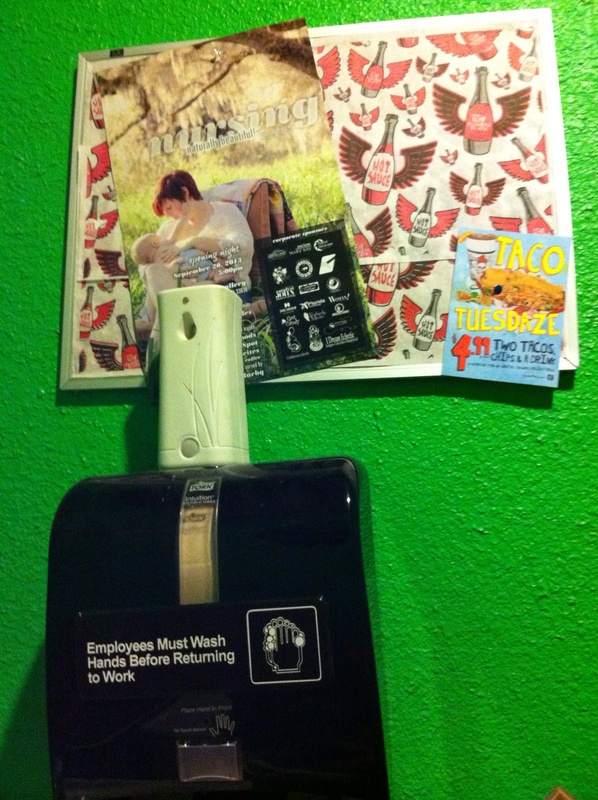 Of course, in this instance, the restaurant’s restroom happened to be where they always kept their flyers, but it was poignant to me to enter and see a woman nursing by the toilet, even if it was just an image; it happens in real life too often. When breastfeeding is hidden, either because society makes the mothers uncomfortable or because mothers are actively asked to nurse elsewhere or cover with a blanket, babies are often nursed for a shorter duration. It is difficult for the mother to constantly be separated from the company she is with or to have to drag her other children into the toilet or other location with her as she feeds her youngest. As babies grow older and the days grow warmer, many babies object to eating with their head under a blanket or nursing cover. Although some mothers have an inner circle of support that enables them to feel comfortable nursing in public and other mothers without that comfort bravely push through some social separation (or the difficulty of pumping, storing their milk, and dealing with the possible consequences of supply irregularity and plugged ducts so that they can offer public bottles) for the sake of their babies, others are less willing. Breastfeeding will become more common and babies will be nursed for a longer duration overall when women are surrounded by the type of breastfeeding culture that sees a nursing baby in a restaurant as one more person having lunch. I am thankful for all of the campaigns that normalize breastfeeding. I am thankful for the mothers who nurse in public according to their children’s needs, because it not only nurtures and feeds their own children, it fosters an environment where other women feel that it would be normal for them to do the same with their babies. I am thankful for the community who make each breastfeeding mother that they encounter feel integrated with everyday life. One day, perhaps, programs like “Latch” will no longer be necessary due to the normalcy of breastfeeding being so widespread that a baby’s need to nurse goes unquestioned. The next time you are in a restaurant and notice a baby nursing, remember that your reaction is part of creating a breastfeeding culture. Bon appetit!